Got a new Apple iPhone and wondering how to transfer SMS from your old Android phone to your new Apple iPhone? dr.fone is your best bet. Download the dr.fone toolkit and install it on your Windows or Mac computer. Launch the toolkit by double-clicking on the desktop shortcut or from the application directory. Click on the Switch option on the dr.fone utility home screen and it will take you to dr.fone – Switch interface. Both the Android and iPhone will be displayed on the next screen. Select the Android device as the Source and iPhone as the destination using the Flip button. Now, select the data that you want to transfer by checking the respective option. In this case, only check the Text messages checkbox and uncheck everything else. 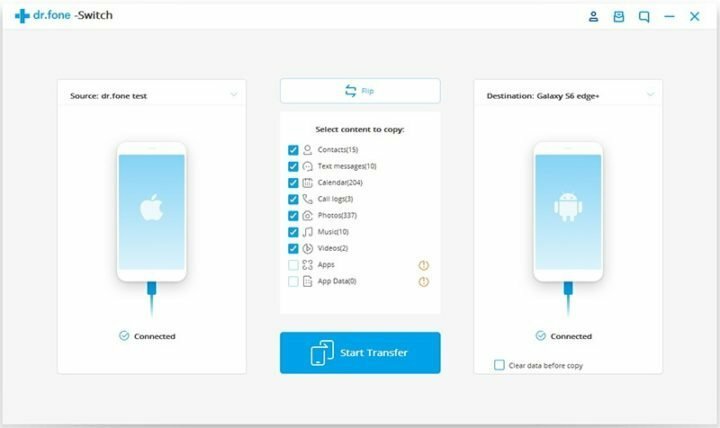 Finally hit the “Start Transfer” button and it will begin to transfer text messages from your Android to the attached iPhone device. Depending the quantity of your messages, however, if both devices are properly connected, this should take between 1-5 minutes. 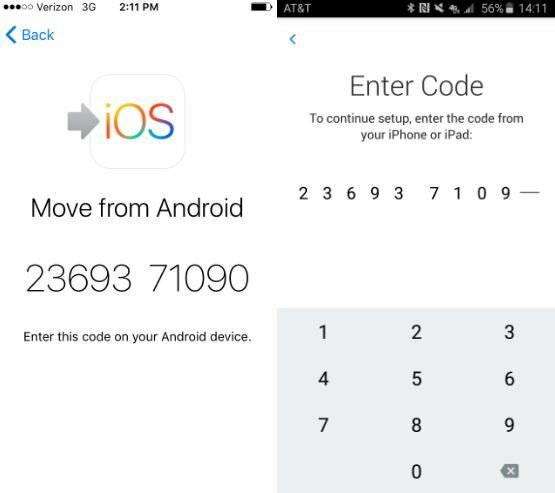 Move to iOS is an Android app developed to make it easier to transfer data from Android to iOS devices. This app is most useful when you don’t have a computer PC to use dr.fone. 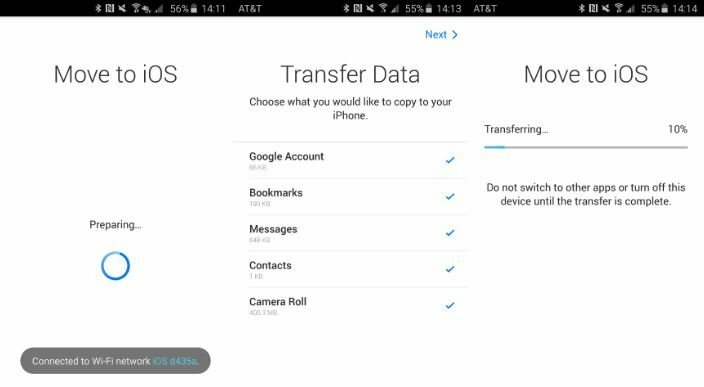 But just like dr.fone, MoveToiOS has it own requirements that you must meet before you can transfer data from Android to iPhone. 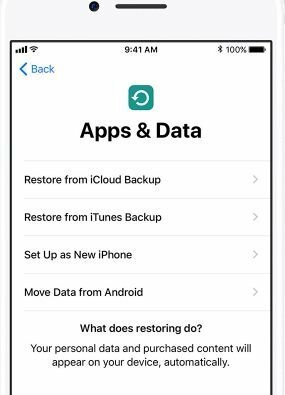 Click on the “Move data from Android” button on the “Apps and Data” screen during the iPhone setup process. If you have already set up the device, then you need to erase the data from Settings > General > Reset and then go to Apps and Data screen. On the iPhone, click “Continue” at the Move from Android screen. It will generate the 6-digit or 10-digit code. Now on the Android device, download and install the Move to iOS app and open it. Tap on “Continue” and then “Agree” at the terms and conditions screen and then “Next” on the “Find Your Code” screen. Enter the code generated on the iPhone in the “Enter Code” screen. On the Transfer Data screen, select the content to transfer and click “Next”. It will start the transfer process and will take some time to complete depending on the size of the data. After transfer is completed, finish the iPhone device setup process. Please Note that this second method is possible only on fresh iPhone devices, that is a brand new iPhone that is being set up for the first time, else you might need to erase the device for it to work.